In our daily lives, we think a lot of things are important. Often, we give things more importance than we give to Allah. When we recite this Labbayk when going for Hajj, we are telling Allah that we are turning away from everything else and we are here, in front of Allah. How can we do this in our day-to-day lives? How can we give more priority and importance to Allah? For example, one way that we can do this is by making sure we recite our prayers on time. Instead of saying that we will watch some TV or play some games first, we should give Allah the most importance and recite our prayers first. Come up with ways that you can make Allah a priority in your life. 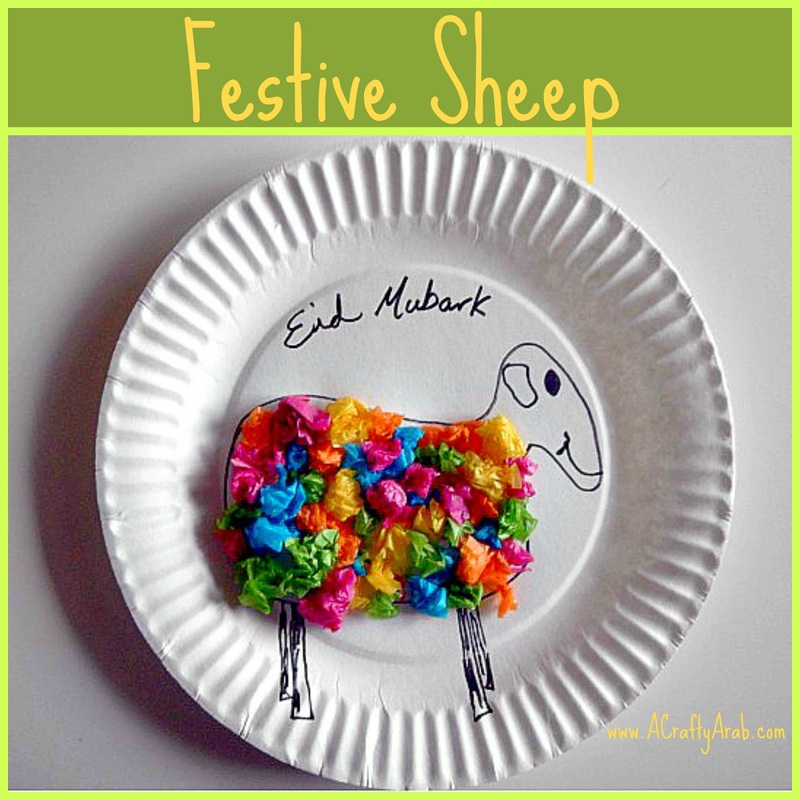 Download worksheet for this here. 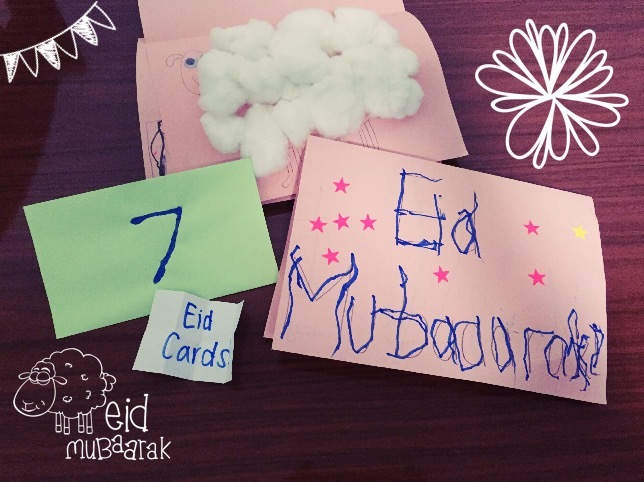 Zil Hajj 7: Eid Cards! 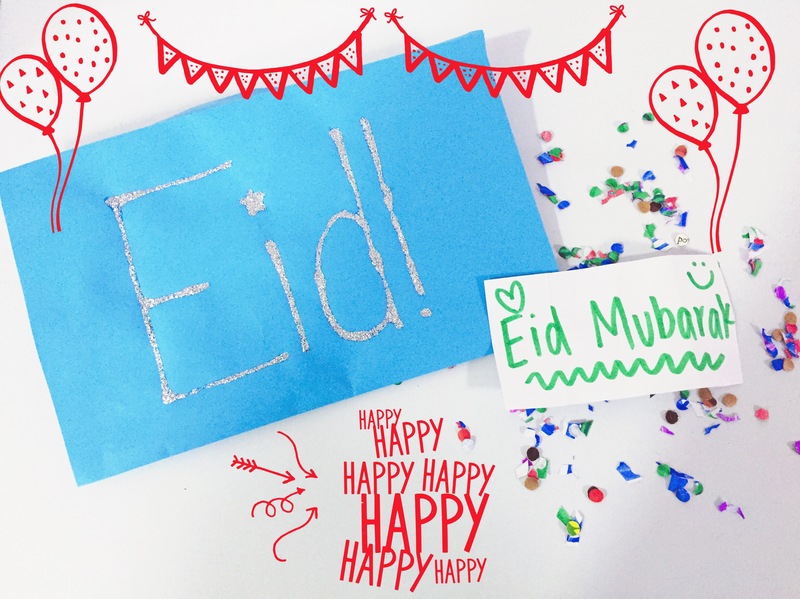 Today is a good day to make Eid cards! 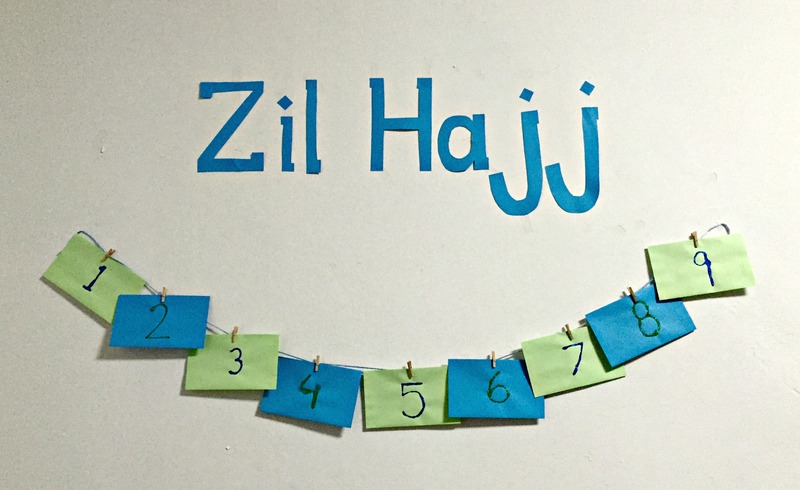 The Day of Arafah is on the 9th of Zil Hajj. On this day, people who have gone for Hajj go to the mountain of Arafah to recite Dua. This is one of the most important days for prayer. 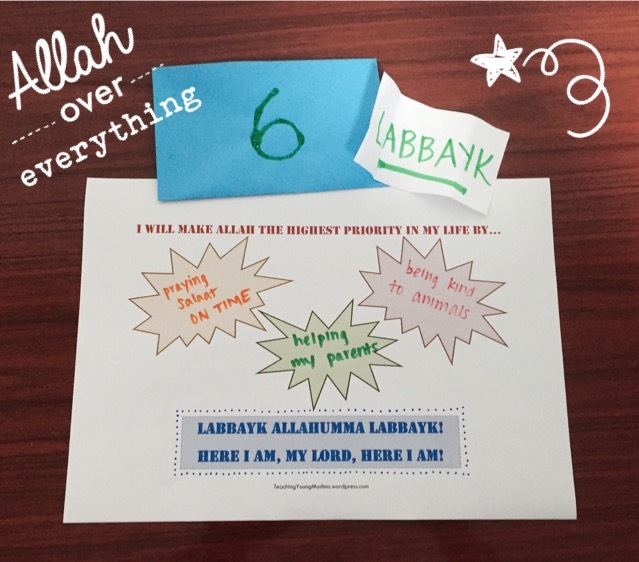 While we are at home, however, we can also participate – we can do Duas on this day ourselves. The time for prayer on this day is between noon and sunset. One of the most important duas that we can recite today is one that Imam Hussain (AS) recited on the Day of Arafah. In Dua Arafah, Imam Hussain (AS) talks about the many countless blessings from Allah. It is a really long dua, so I have taken an small part of it that I feel is particularly important. In this section, Imam Hussain is talking about all the details of our bodies and lives that we take for granted, but in reality, all of these things are blessings from Allah. The most powerful line, in my opinion, is when Imam Hussain (AS) talks about thanking Allah for all of these blessings, but being unable to, because in order to thank Allah for these blessings, we would have to use another one of the blessings. For example, just the act of saying “Thank You, Allah” requires the use of our facial muscles, our tongue, our breath, our vocal cords – all of which are blessings. Every day, every moment – all the parts of our body bear witness that we cannot thank Allah for a single blessing without requiring the use of another blessing. It’s all connected. For older kids, HERE is a simplified excerpt from Dua Arafah. As you consider all the blessings you have from Allah, you decide to do a prayer to thank Allah for everything. In order to do this 2 rakat Prayer of Thanks, you realize that you have to use many blessings from Allah in order to even thank Allah for some of his blessings. From the water you use to do Wudhu to your lungs that allow you to breathe in order to speak and pray – His blessings on us are uncountable. 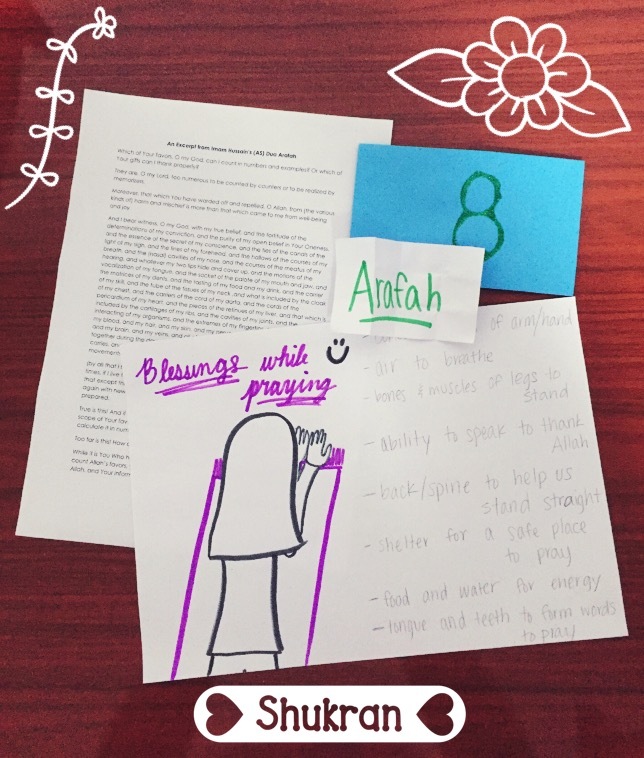 Draw a picture of a person praying Salaat to thank Allah. Write a list of all the blessings that you can think of that this person uses in order to complete his/her prayers. From the bones and muscles to the air we breathe – how many can you think of? When Prophet Ibrahim (AS) was commanded by Allah (SWT) to sacrifice his son, Prophet Isma’il (AS), Shaitan came three times to distract him and try to lead him away from Allah. Shaitan wanted Prophet Ibrahim (AS) to disobey Allah. At each time, Prophet Ibrahim (AS) threw stones at him to make him go away. Today, when we go for Hajj, we go to Mina. While we are in Mina for three days, we go to the stone walls that are built to represent Shaitan and throw stones at each pillar. We stone the Shaitans to remember Prophet Ibrahim (AS) and the way he was committed to Allah and His command. How can we “stone” the Shaitans in our life? How can we remove our obstacles and become closer to Allah (SWT)? 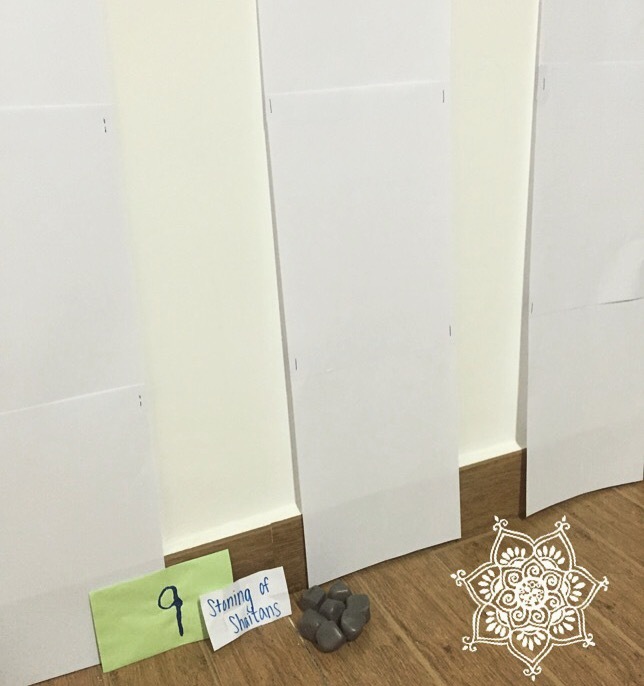 Create pillars on the wall by stapling 3 sheets of paper together so that it makes long strips of paper like pillars. I kept my pages in portrait orientation. Three sheets of paper each time makes 3 pillars. Number them 1, 2, and 3. Tape the pillars on the wall some distance apart. Discuss how Shaitan tries to convince us to disobey Allah. As you discuss the ways that Shaitan distracts us, throw seven stones at each pillar, just like we do when we go for Hajj. On the day of Eid, we recite the Takbir of Eid in praise of Allah. It is Mustahab to recite these Takbir on Eid after Eid prayers, and the following 10 prayers, from Zuhr on the day of Eid to Fajr on Zil Hajj 12th. To download a handy page of the Eid Takbir, click HERE.